"What is the answer to the world's problems?" is the all-important question of today. "What can we do to save ourselves from captivity, from slavery, from utter destruction?" Is there any "pat" answer that can be given to these queries? Is there any answer -- one that is certain, positive, absolute? If so, who holds it? Where must we go to find it? What must we do to obtain it? Most of the world has tried some form of ideology, of theology. Scientific endeavor has been applied. The discussion approach has been used over and over, yet misunderstandings, bickerings, selfishness and political fanaticism, like the "dog-in-the-manger," still block any appreciable progress toward planetary peace, serenity, security. Does not the trouble seemingly stem from the nature of humanity? Has it, from its fabled inception, brought forth an ultimate other than death to whatever it purportedly evolved, produced, generated or fathered? Were not greed, selfishness, fear, falsity and hatred the motivating impulses that prompted Adam and Eve to partake of the forbidden fruit, and later caused Cain to slay his brother? Who is to say it is a national warp that must be taken into consideration before we can know harmony? Who is to say it is a racial quirk that blocks our progress? Who is to say that color is the "great threat"? Who is to say that we "labor in vain" because we have forsaken the God-of-our-fathers? Yes, one will advance this theory that theory, and spend valuable hours trying to convince his neighbor to the rightness of his particular stand, but is his particular theory any more valid than that of his neighbor? In our works on Infinite Reality it has been our endeavor to make clear that the trouble is not with God, nor with man. We have set forth the nature of Truth, of Life, of Reality wherein naught beside can be. 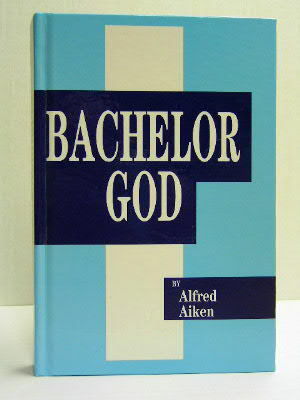 In BACHELOR GOD we point out the impossibility of a coexistence of Life with death, Truth with error, Good with evil, Reality with absurdity, Spirit with humanity. Truth is not a theory, not a humanly devised system for social application or consumption. Truth asks for no following, and can have none by the very nature of Its Single Infinite Omnipresent Totality. Truth is not undergoing evolution, nor does It permit or advocate revolution. It does not admit or permit personal or national enslavement, control, indoctrination. Truth does not know or promote any "ism" whereby the masses can be manipulated as herds of sheep. Spirit is not putting the human race on trial, not trying to sift the worthy from the unworthy, or testing any "body." Intelligence alone is the sole answer to our opening queries. By this we do not mean human theories, devised forms or systems that will lead us to a desired end, but Intelligence Itself, that which is sometimes known as Spirit, Mind, Love, God, the Sole Self-that-is-Life-in-Action here and now. To approach the great question: "What is Truth?" by way of a human doctrine, opinion, assumption is to entirely ignore Truth. Only Truth knows Truth; only Intelligence, the Infinite Mind, knows Itself, for naught less than this Omniscient One can know Itself. For too long the so-called finite, the human sense called "man" has presumed to sit in the seat of Awareness, babbling nonsense which it would pass off as Intelligence! In its self-conceit this assumed mentality, this finite guesser pontifically pronounces its decisions as to what is so, and what is not, but so far it has not touched Infinity, and never will. Let us no longer cling to opinion, but let us "begin" with what Infinite Intelligence, the Alone Spirit knows Itself to be, for this alone is the answer to our world's problems. How? Because where Truth is, where Infinity is, where Existence (Life) is, Its pretended finite reverse ( Its would-be absence) cannot possibly be! In other words, this volume (as all our books on Reality) deals with REALITY WHICH IS OMNIPRESENTLY IN OPERATION, and not with the finite assumptions of Truth's negation. In this book we deal with that which is practical, not with theories which have proven themselves impractical from their inception. We point out the nature of honesty, in lieu of dishonesty; Affluence in lieu of poverty, want, limitation. We deal with WHAT WE BE, not with the assumption that we are mere chips off the block of humanity. Should one attempt to read this volume as he would a novel, he is certain to perceive little if any, of what it says. If one reads with the intent to behold a fresh view of an age-old question, he will be delighted over his "discovery." None can fail to behold a "new world, a new Self" if he will be honest with his Self as he reads. That our exposition be even more clear to the one who picks up this book for the first time, who "comes to it fresh," let us emphasize that this is not metaphysics, not theology -- even though we mention God, Spirit, man, and so on. This work, while pointing out certain failings of religion, is not anti-religion. The same holds good for education, but we are not anti-education. In Fact, we are not anti aught! Our approach to the momentous questions of the day is rather one of philosophy, not theology. To try to read metaphysics into it, is to adulterate it. To assume that we are merely repeating what has been said before, is to "mist"-read. There is a certain amount of repetition in the context of this volume, but this is intentional. Our statement of Truth is revolutionary -- our comments on man, controversial. Because of this we highlight major facts by reiteration. These will serve to emphasize important points to the earnest reader, and so prove helpful. Semantics are such that a new viewpoint is difficult to make clear at a single glance. While we use words that are familiar to the average metaphysician or religionist, the reader must weigh carefully the deeper definition of each word, its order, its capitalization if he would actually behold our meaning. Unless he does, the material will seem absurd, if not downright preposterous. So, here is to happy reading.